Whenever the subject of ‘worst fears’ comes up, a lot people have to think really hard to come up with something. I always wondered if it was because they aren’t afraid of anything or if they’re afraid to say what they’re afraid of. I never have to think very long about my worst fear. Cockroaches. I mean honestly, they’re the worst. It doesn’t make me a sissy, either. I’ve seen guys who are basically body builders jump a little when they see a roach. By association, I’m kind of afraid of the dark too – since that’s where cockroaches live. Our fears can drive us to do some pretty silly things. For example, I live by a personal code that every small, dark moving object is treated as a roach until proven otherwise. So I’m the guy who’s always glancing around the room every time I think I see something suspicious in my peripherals. But let’s be honest. Sometimes our fears drive us to do things that actually affect our lives in serious ways. One fear many of us have is embarrassment. Being embarrassed usually leads deeper to being ashamed. When we’re ashamed of something, we tend to hide it. Remember those people I talked about earlier who think of something simple and don’t say their real worst fears? Confession: I’m one of them. I started to believe that no one could actually love me forever. Not if they knew the real me, when I’m having a bad day and I’m at my worst. Love that lasts forever, marriage, it all seemed far away from me, like it couldn’t be real anymore. I also started to wonder if I could actually love someone forever, too. This left me really scared. I never told anyone about that fear. In fact, I hid it deep in my heart. Then one foggy Christmas eve, Santa came to say… wait, scratch that, sorry. Wrong story. Then one snowy Christmas eve, I was on vacation with some friends. When we got back to our cabin that night, since we’d been at the vigil Mass, we put the baby Jesus figure into the nativity scene. That image was powerful for me and I started to think a little bit more about what Christmas and Advent were all about. See, the nativity scene is sort of messy. Looking at it, I was always a little confused. Why does this barn only have three walls? What’s with the animals? Who are those three king-looking dudes and what are they holding? The whole thing made no frankin’ sense to me. Why would Jesus want to be there? It’s not fit for a King. What I came to realize is that it’s exactly where Jesus wants to be! Right in our mess. 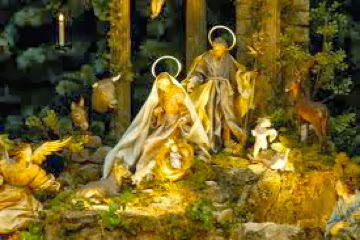 Most scholars agree that Jesus was actually born in a cave, not a stable. I got to thinking… is there anywhere on Earth darker than a cave? Not that I’ve seen. I’ve been caving a few times before, and it’s about as dark as dark gets. t afraid of the dark. He’s not afraid of what’s hidden in the dark, whether it’s cockroaches or the brokenness in our hearts. This Christmas, the Light of the World is coming crashing in to our darkness. We don’t need to be ashamed of what He’ll find there. He’s coming with His power and His healing. He’s coming with love! Love! The very thing I was afraid I was incapable of! When I let Jesus into that part of my heart, He really turned things around. I had so many wounds that were able to fester since I kept them in the dark for so long. He helped a lot of questions get answered, and helped me come to terms with the ones that just might never be answered. He helped me love selflessly and showed me how to receive love again without fear. Jesus didn’t come to blame me for my mess. I’d done plenty of that. He came to pick up the pieces and make something beautiful. So my encouragement to you this Advent is to continue to make room for Jesus. Find the places in your heart and life that maybe you’ve kept out of the light for a while. The places you’re ashamed of. Let Jesus in because it’s exactly where He wants to be born into this Christmas. He isn’t afraid of the dark.